The Tuning Fork hosted managers, industry professionals and celebrities, as everyone came together to celebrate the people behind some of the biggest artists in the New Zealand music industry. The MMF Music Managers Awards celebrates the very best of those New Zealand music managers who support their artists every step of the way. The awards have become one of this country's most respected music industry events, and tonight was no different. For the second year in a row, Ashley Page took home the prestigious 'Recorded Music NZ Manager of the Year' award for his work with the artists Broods, Joel Little, Jarryd James, and Alex Hope. Ashley has continued to take his artists from strength to strength in the last year. Broods won four Tuis at the 2015 Vodafone Music Awards and played five US music festivals, while Joel Little was nominated for 3 APRA Silver Scroll Awards. Ashley also signed Jarryd James to Interscope who clocked up 40 million streams worldwide. He also started working with songwriter Alex Hope who co-produced Troye Sivans international hit EP Wild, which went to #1 on Itunes in 50 territories. 'Breakthrough Manager of the Year' and the 'NZ Music Commission International Achievement Award' was presented to Alastair Burns who looks after the careers of Marlon Williams and Julia Jacklin. Under Alastair's wing Marlon Williams has won two New Zealand Music Awards for Best Male and Breakthrough Artist of the Year. Williams also received a nomination for the Taite Music Prize and an Aria award and was shortlisted for a Silver Scroll. In 2015 and 2016 he completed 3 US tours and received critical acclaim for his debut album from the likes of The Guardian and Mojo. In the same year, Julia Jacklin spent the majority of her time traveling internationally to secure interest from 15 record labels and performing at one of the most talked about shows at South by Southwest. The prize for 'Best Independent Tour' was awarded to Mel Parsons. Mel booked, promoted and performed her twenty-three date 'Drylands' Album Release Tour. If this was not enough she also arranged a five-date tour to some of New Zealand's most beautiful and iconic theatres with Julia Deans. The prize for 'Self Managed Artist' went to country singer Tami Neilson. Tami was awarded Best Country Album at the 2015 NZ Music Awards. She also scored a TV series soundtrack for The Brokenwood Mysteries, and her album 'Don't Be Afraid' hit #1 on the NZ album charts and iTunes. All this while seamlessly managing her own career. It was not only individuals who are celebrated in the MMF Awards. 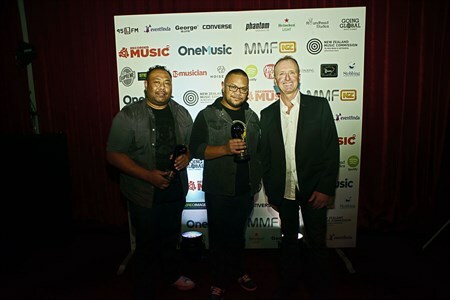 Live music would not be possible without venues, so tonight there were also awards presented to Auckland's Studio for 'OneMusic Best Large Venue,' and the award's home The Tuning Fork were awarded 'OneMusic Best Small Venue. 'Voted for by MMF members only, these awards acknowledge the roles of all those working at the venues to ensure their gigs are amazing for artists and fans alike. The 'Industry Champion' for 2016 was awarded to Teresa Patterson of CRS Management. Over the course of her 20-year career, Teresa has had extensive experience in all aspects of the NZ Music Industry. This has included developing and implementing domestic and international business strategies for recording artists under CRS Management as well as Polygram and Virgin Records. Her experience is second to none. She has run successful marketing and communications campaigns for artists, tours, and festivals including Big Day Out and Auckland City Limits. Teresa has been the Chairperson of the NZ Music Managers Forum since 2007 and has grown the MMF into an industry-wide respected organization. She has been awarded 7 MMF Music Manager awards.